What better way to start a birthday celebration than with a marathon! 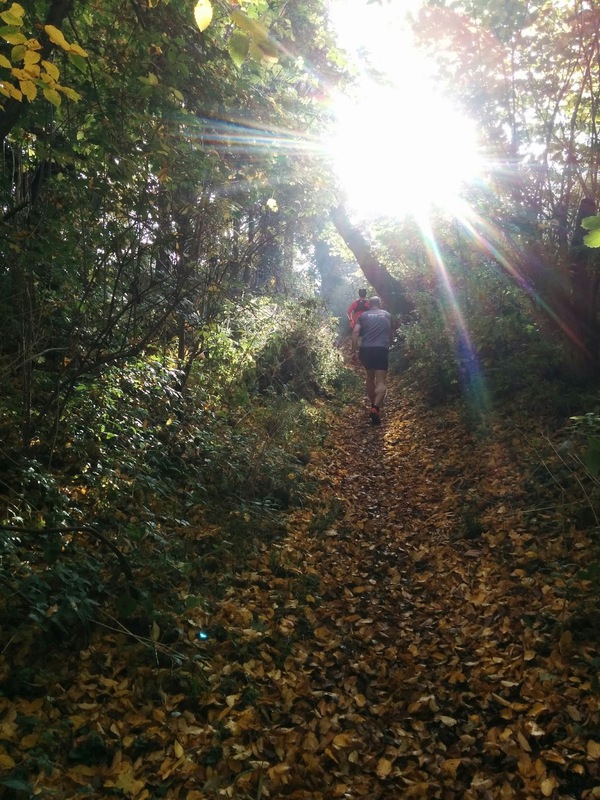 The 2015 Trailscape Rail to Trail series kicked off today in Newport in Essex. This was my second Trailscape race and the organisation and atmosphere was exceptional, right down to the pumpkin stickers for adding to your race number. We set off in chilly conditions, immediately crossing a railway footbridge to warm up the legs. Then followed a gradual climb on a rough track to really get a quick warm up out of the way, before settling into a mixture of mud, grass, gravel tracks and a very small amount of tarmac. And a fair bit of water, but that was later on. At two miles I was surprised to see all nine runners ahead of me ignore a left turn arrow. As I reached the arrow I was surprised to find myself leading a marathon as I shouted for them to come back. It obviously wasn't going to last but I held onto the lead for a couple more miles! And then the water. Lots of it. All the way across the track at one point leaving no choice! Cold feet for the next mile. The route was well marked and the miles flew by. Great support at the two checkpoints on the route helped and I was running a little quicker than I should have. One nasty little hill a mile before the end of the lap followed by a mile flat then downhill to stretch out the legs before blasting through checkpoint 3 at halfway in 1:50. Onto lap 2. I knew what to expect now and had to ease up a bit, having run too fast for the last few miles. 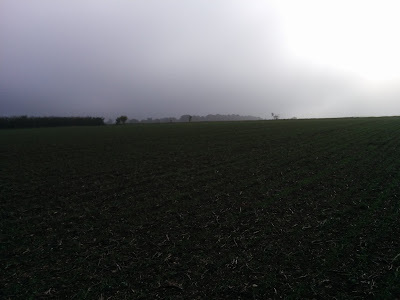 The wind had picked up and the first few miles across fields were bleak in the fog. I was running on my own now but knew that the half marathon leaders would soon be steaming past. They started two hours after the marathon so I had a ten minute head start on them on lap two. It was motivating to see them catch and then pass me, about a dozen fairly close together. Then I was running mostly on my own again between the two checkpoints. It was nice knowing what was coming up. Trail running is never boring - with so much to trip and slip on, and the surface changing at least once a mile, it requires enough concentration to keep your mind occupied and whatever is leftover you get to enjoy the views with. The sun came out at some point, enough to make me feel too warm. The flat mile or so leading up to the last climb was a bit of an effort, but the climb itself was fine, too steep to run anyway. Great support from the marshals taking numbers at the road crossing at the top again, and then onto a flat field edge for the last mile home. My calves were just beginning to cramp. Lots of runners around now, but these were all half marathon or 10k runners so I wasn't too worried about losing places like last week now. Downhill, back over the railway bridge and into the finish, to cheering and hot food and a coffee to recover. A big thank you to everyone involved in this race - marshals, organisers and all the runners. 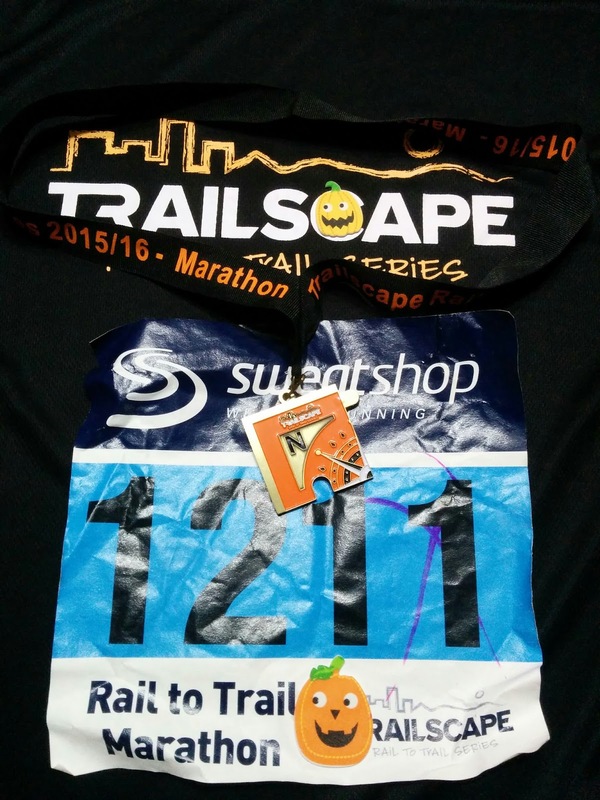 I'm already entered for the other three marathons in the Rail to Trail series. I finished 7th overall (out of 52) in 3:51:55 to complete my 89th marathon.